Overall a good powerplay, 1/50, Finch 20* and White 4*. 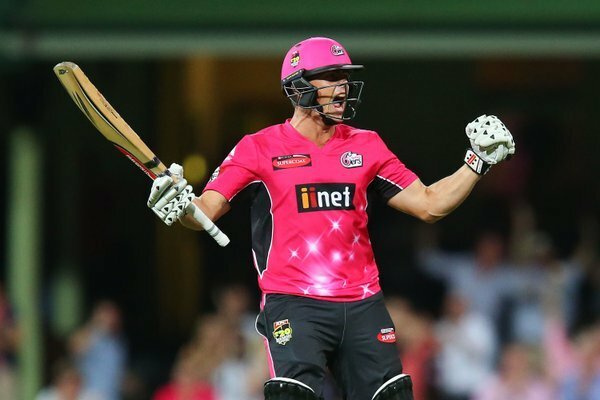 And the fireworks come to an end, Gayle caught in the deep for 23 (16). 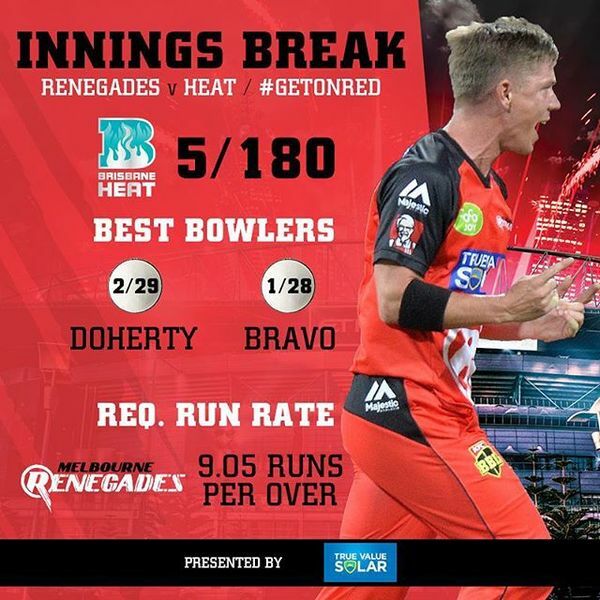 Gayle now has two big sixes with the Renegades 0-29 in the fourth over. Where are you watching from? 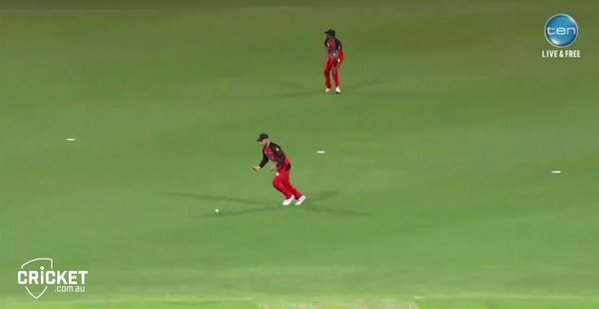 That's an outrageous shot from Gayle! Yep, that's one way to get off the mark Finchy! 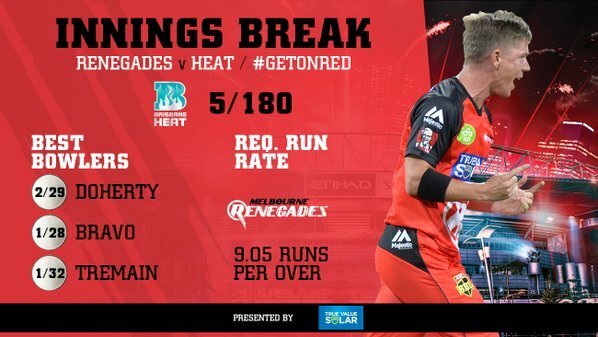 Some great late hitting from Cutting and Hopes guides @HeatBBL to 5-180 from their 20 overs! Enough? 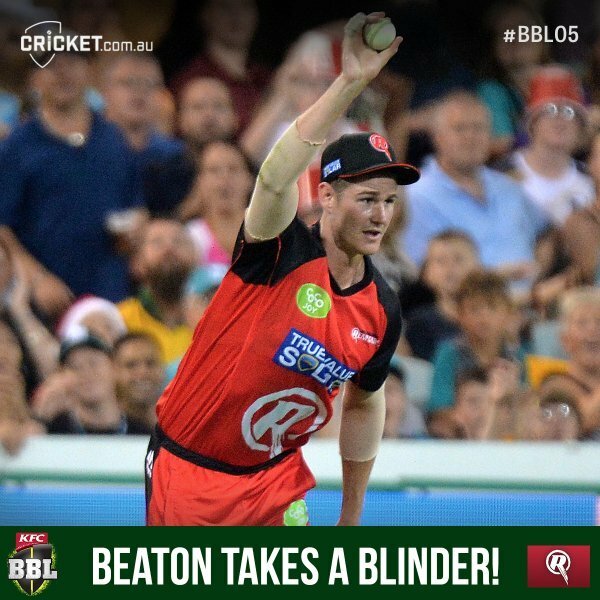 That's an outstanding catch from Beaton! Heat now 5-130 in the 17th over. That's a great catch from Beaton running in the deep! Reardon out for 28. Heat 5-129. 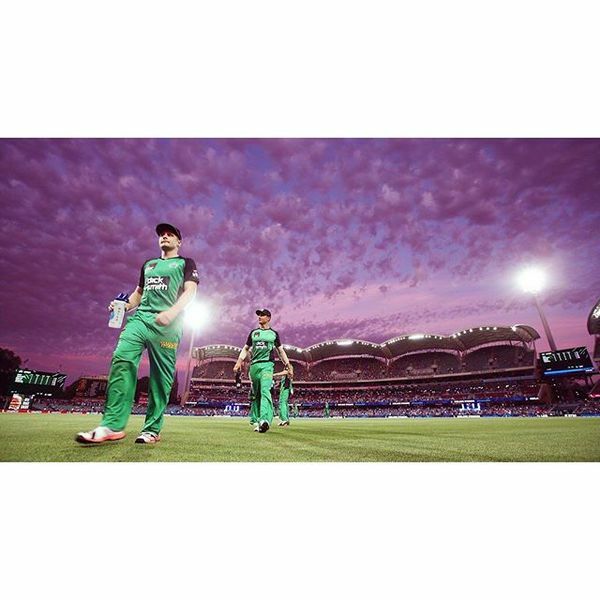 Four overs left in the @HeatBBL innings and they're 4-129. Reardon ready to launch on 28*. 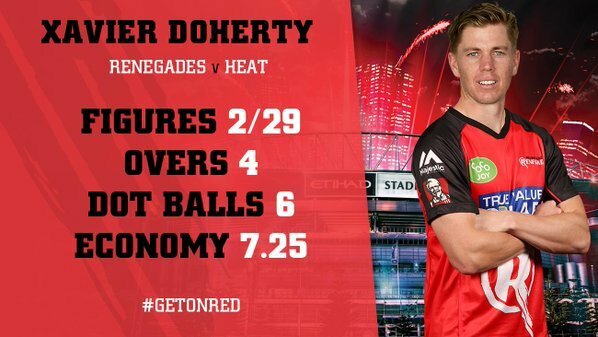 Doherty's first four overs as a Renegades come to an end. 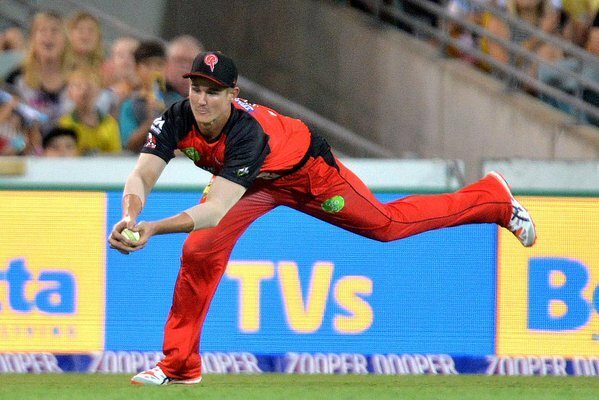 Five overs left, Brisbane 4/119. A great effort in the deep, but four more to the score! Heat 3-114 (14). 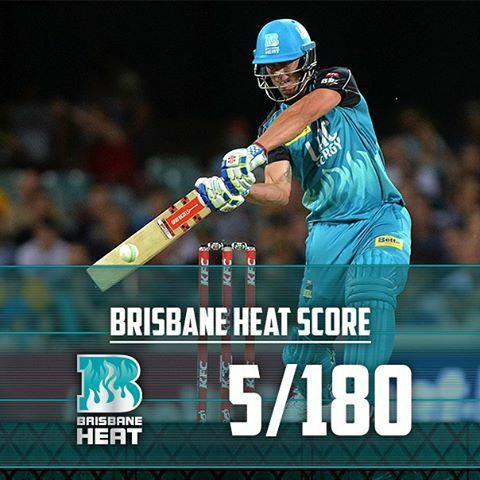 That's the 100 up for the @HeatBBL in the 13th over. 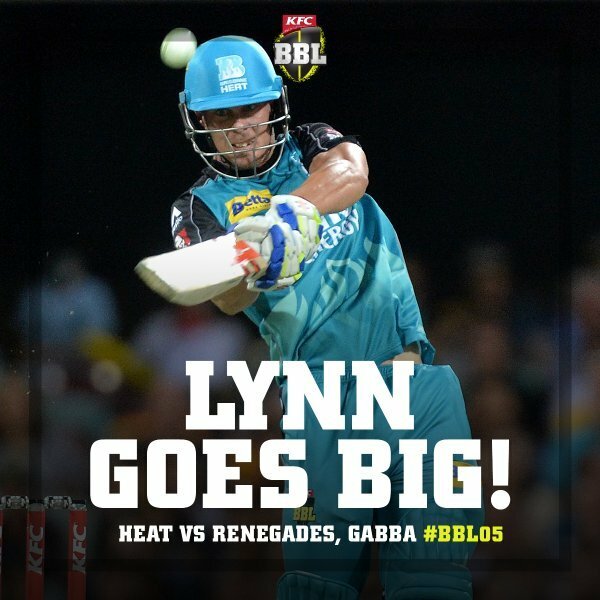 Lynn 29*, Reardon 9*. What will they finish with? Here's our first appearance of the #UniverseBoss @henrygayle . Lynn is having some fun now! He goes 6,6,4 to start the Walker over! Heat 3-82 in the 11th over.